When a homeowner in suburban Chicago asked for a waterfeature and swimming pool that were aesthetically linked to one another and their surroundings, watershaper Lou Downes knew that close collaboration with the landscape architect would be crucial. The resulting composition offers a perfect testimonial to the value of getting client, designer and contractor all squarely on the same page. One advantage of building pools in the affluent Chicago suburb of Lake Forest is that many of our prospects have seen inspiring landscapes, pools and waterfeatures in neighboring backyards or at quality resorts around the world – and, as a result, come to the design process with plenty of ideas. With all of that experience and thoughtful exposure to the possibilities of water, quite often they’re already visualizing the way they want their backyards to look. Such was certainly the case with the project seen in this article: The homeowner came to us with an armload of photographs and knew exactly what she wanted from the outset. And the canvas for her imagination was plenty big, with a backyard measuring more than two acres and including a pond shared with an adjacent property. Working carefully with that spaciousness was important, because the family included two small children and she was obviously concerned with their safety. She was also after a sense of privacy in the space and with integrating it with the look of their five-year-old home. Balancing all of these issues was important from the design phase through to finish work. The key in all of this was the relationship we at Downes Swimming Pool Co. of Wheeling, Ill., forged with Daniel Horvat, principal of the Horvat Design Group, who developed a spectacular design for the sprawling space – one that freed us to create a watershape worthy of the setting. [ ] Given the fact that her pond-sharing neighbors to the west could easily view her entire backyard, the orientation of the pool and the landscaping design needed to create an area with a sense of seclusion – that is, a space that would be cut off visually from next door. [ ] Local highway noise was noticeable in the backyard, and the homeowner wanted to use the soothing sounds of running water to offset the constant rumble of traffic and make the ample exterior space more enjoyable. [ ] The homeowner wanted the pool and waterfeature to appear as though they belonged together – and fit seamlessly within the woods and prairies found in and around Lake Forest as well. Ultimately, the design accommodated all three points at once through careful orienting of the project; altering lines of sight by setting up a large rockwork structure to obstruct the view from the other yard; planning for a lively, high-volume waterfeature; and following a skilled landscape architect’s approach to contours, textures and finish details to the letter. A big part of the design had to do with surrounding the pool and waterfeature with details that tied individual components together visually and created a sense that everything had been in place for a very long time indeed. Setting large rocks and planters at the water’s edge was crucial in making it seem as though the deck had been placed in and around natural formations and outcroppings. One key early decision was to separate the pool and waterfeature hydraulically. Where most watershapes of this sort can be run off single recirculating systems, the plans for the rockwork and its high-volume cascades made such simplicity impractical. The rationale for a dual-system approach mainly has to do with the fact that the 120 gallon-per-minute flow rate required by a waterfeature of this size would be throttled considerably by running it though a residential-sized pool filter and heater. The 950-square-foot pool is large by residential standards, but the design team didn’t think it warranted the use of larger, commercial-grade equipment – and another considerable jump in costs that upgrading would have entailed. To be sure, this decision raised the costs of support equipment, installation and long-term maintenance, but in the long run those costs are largely offset by long-term energy savings realized by not redundantly heating and filtering water drawn from the grotto area to feed the waterfeature. We estimate that this saves approximately 10% on heating costs annually. As designed and built, the waterfeature now consists of a detailed rock hardscape – one of Horvat’s many specialties – placed in such a way that its five-foot-tall profile and accompanying foliage completely block any views of pool activities from the common pond area. Addressing the safety issue, the watershapes are positioned so they can be supervised easily from any part of the entertainment-oriented patio adjacent to the house. I’ve seen enough of his firm’s work to know that he means what he says – and that this project was particularly successful in meeting his high standards. The rockwork is dense with pockets deep enough to hold soil and perennial flowers, and they’ve been planted with flowing blue-rug junipers and rock cotton-Easters. In the spring, the flowers and colors are vibrant and lend beautiful contrasts to the rocks. The main waterfall lends a substantial visual core to the design, but its appeal is more than aesthetic. For one, its noise significantly masks surrounding commuter traffic noises. For another, its robust flow gives a soothing neck-and-shoulder massage to bathers who enter the grotto area. And this is far from a simple stack of rocks: Horvat’s goal here was to make the waterfeature look “lived in,” like a natural outcropping and spring that had been there for hundreds or thousands of years. His planting plan was an important means of conveying this impression. Keeping foliage in and around a large rock formation such as this requires water. The trick is to provide it in subtle ways that do not distract from the natural look we were after. There are two basic ways of going about this: Plants and soil can either absorb moisture from underground irrigation systems, or they can capture excess moisture as it trickles down rocks from irrigation-line pop-ups. We used a combination of these strategies. Not all plants receive ample water in rock settings no matter how water is introduced to the system, however, so Horvat also used a variety of sedums as a water-sheltering ground cover along with the flowering plants. And where the gaps created in the rockwork were too small for plants in containers, he pulled the plants out and set their root balls into various nooks and crannies, again using ground covers to retain moisture. As we considered the interior finish of the pool and, specifically, its color, the owner went on record with her desire for a dark hue to enhance the pond-like appearance of the watershape. Ultimately, however, we compromised with a lighter, French-gray shade out of concern for depth perception and the safety of children entering and playing in the pool. In the upshot, the chosen gray finish is actually dark enough to yield a profound pond-like impression – and blends beautifully with the surrounding stonework as well. Another important step in making the overall pool/waterfeature combination look natural involved setting up several planters in and around the pool’s perimeter. Horvat’s extensive experience with pools and adjacent plantings was critical here. He filled the poolside planters with indigenous natural grasses – including miscanthus and gracillis, which are particularly resistant to pool chemicals and the effects of splash-out. These natural grasses were combined with the homeowner’s choice of flowering plants. Knowing that plants can’t thrive on intermittent pool-water spillage, Horvat ran take-offs from the backyard’s central irrigation lines directly to each planter. He also broke up any sense of uniformity at the water’s edge by using natural rock material in place of sections of decking to create a sense of transition from the open deck areas, through the planters and beyond the free-form pool into the waterfeature. Inside the pool, a French-gray Hydrazzo finish helps reinforce a pond-like impression. In addition to working on aesthetics that draw everything together, we at Downes Swimming Pool Co. placed some of our focus on keeping things apart. On the one hand, the circulation system for the pool was quite straightforward; on the other, however, the waterfeature’s system was a different story. Hydraulics for waterfeatures such as this one are always crucial, because you need to set things up so that just the right amount of water flows over and through the installation. Too little flow results in an anemic drizzle, where too much water flow can create gushing effects that ruin the natural impression. What we were after here was a system that operated comfortably between those extremes, with actuator valves that give the family the opportunity to control the flow and the mood created by the water effects. An interesting touch for this project was the inclusion of “floating” rock steps that look natural while serving to separate the waterfeature/grotto area from the main pool and providing easy passage from side to side of the large expanse of water. The challenge of building these floating rocks was in ensuring their longevity. We knew that any freeze/thaw cycle worth the name could snap the rocks right off their supports if they were poorly mounted. In setting up the steel cage, we positioned vertical rises for the rock/step’s 12-inch-diameter piers and tied them into the floor’s steel to make the structure monolithic once shotcrete was applied. We notched the rocks for snug fits on the piers, then core-drilled completely through the rocks down 12 inches into the piers. We then inserted coarse-threaded rods that we’d notched for better holding power, securing them with hydraulic cement. The actuators don’t change the flow rate, which holds at a constant 120 gpm. Rather, they control where the water is introduced to the cascades via manifolds set up to deliver water to the top and/or the middle of the rockwork structure. Given the 120-gpm circulation system, the suction side of the system presented a potential for suction entrapment – an issue we defused by using two main drains covered with 12-by-12-inch grilles. Both main drains use three-inch piping that returns the water to the waterfeature via a three horsepower pump. The entire system is controlled automatically by a Jandy system mounted about 200 feet from the pool at the equipment pad next to the house. 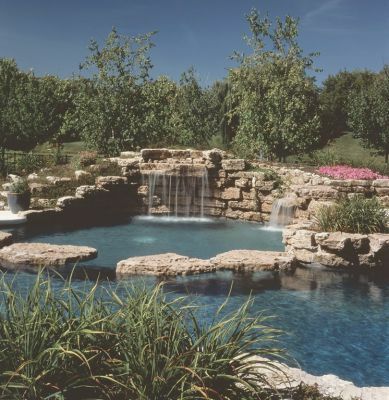 While activation of the waterfeature and pool functions with the supplied remote control can easily be accomplished from any point on the pool deck, the homeowner wanted to be able to control the waterfeature from the far reaches of the property, surpassing the radio-frequency range of the remote control. To solve the problem, we “extended” the antenna of the receiver by wiring it to a nearby downspout, thereby transforming the home’s metallic gutter system into one large antenna. Another issue in the design process had to do with managing a transition from the existing patio to the deck/pool/waterfeature area beyond. Horvat worked through this problem skillfully, extending the free-form shape of the watershapes to its decking and curving it into a concave portion of the original kidney-shaped deck and pavers. A group of rock steps leading up to the patio not only accommodates a one-foot elevation change between pool deck and patio, but also acts as a transition between the new project’s rock formations and the brick patio. The rocks are used throughout the space to tie everything together. In fact, Horvat used the same types in the steps and other garden areas as he had used in the waterfeature, decking and planters, thus bridging the gaps between old and new construction. The lower cascade adds to the impression that the rock formation is natural and that water flows over it via random, multiple pathways – a key in the landscape architect’s ambition to avoid the “volcano” look. Furthering the impression is a small stream that flow around from the back of the structure before easing its way into the grotto area. Safety concerns also led to inclusion of a five-foot-high wrought-iron fence around the pool area. This way, the children can play in the rest of the large yard unsupervised, without getting into the pool area. The fact that the yard slopes down and away from the house worked in everyone’s favor: She can sit on the patio and see into the far corners of the backyard right over the fence. With the issues of privacy and visual integration fully addressed, it was gratifying to find, when the system came on line and the water started to flow, that we’d also succeeded completely in addressing the noise issue. The constant motion of the waterfalls covers the sounds of the nearby highway, and the calm is preserved even when speeding commuter trains pass through the area every 20 minutes or so. It’s with no small measure of pride that we look back on this job, knowing that the client is completely satisfied with the results of our collaboration with her and the landscape architect. In this case, the aesthetic touches and the overall system design now work in a collaboration of their own, providing the family with a reliable watershape in an uncommonly beautiful design and setting. Lou Downes is co-founder and president of Downes Swimming Pool Co. in Wheeling, Ill. For the more than 33 years, the firm has provided gunite pools, spas and waterfeatures for homes and clients throughout Illinois, Wisconsin and Indiana. Downes also consults with architects, pool builders and landscape architects on a nationwide basis, and his company has won several national design awards and hundreds of regional and local design awards from the National Spa & Pool Institute.